Ever since Germany had inflicted defeat upon France in the Franco-Prussian War of 1870-71, the major nations of Europe had busied themselves with plans for the next war, seen by many as inevitable given the conflicting ambitions of the major powers; which, in the case of France, included the repossession of Alsace and Lorraine, both lost to Germany as a consequence of the Franco-Prussian War. Much is made of the German Schlieffen Plan and, to a lesser extent, the French Plan XVII. But what of Austria-Hungary's Plan B and Russia's Plan 19? This article details the primary aims of each of these plans, and discusses the rationale behind them. The chief aim of Plan XVII, devised by Ferdinand Foch in the wake of the humiliation of the Franco-Prussian War, and taken up by French Commander-in-Chief Joseph Joffre in 1913, was the recapture of the territory of Alsace and Lorraine. Entirely offensive in nature, Plan XVII made extensive use of the belief in the mystical élan vital assumed to be instilled within every Frenchman - a fighting spirit capable of turning back any enemy by its sheer power. It assumed the average French soldier to be more than a match for its German counterpart. Indeed, numerous French officers were dismissed from the army during the early stage of the war for a want of fighting spirit, including General Lanrezac following the French army's failure at Charleroi. More technically, Plan XVII called for an advance by four French Armies into Alsace-Lorraine on either side of the Metz-Thionville fortresses, occupied by the Germans since 1871. The southern wing of the invasion forces would first capture Alsace and Lorraine (in that order), whilst the northern wing would - depending upon German movements - advance into Germany via the southern Ardennes forests, or else move north-east into Luxembourg and Belgium. The architects of Plan XVII, which included Joseph Joffre, took little account of a possible German invasion of France through Belgium until just before war was declared; and in modifying the plan to deploy troops to meet such an eventuality, actual French activity to meet an invasion via Belgium was lacklustre at best in August 1914. Before war broke out Joffre and his advisers were convinced that the threat of British involvement would keep Germany from invading through Belgium (with whom Britain had a treaty guaranteeing its neutrality; Germany regarded this as a mere "scrap of paper"). Whilst the French had accurately estimated the strength of the German army at the opening of the war, they did not place much emphasis on Germany's extensive use of reserve troops, having little faith in their own. This proved a serious miscalculation which, in conjunction with an underestimation of the Schlieffen Plan, almost led to France's undoing within a month of the outbreak of war. Within weeks of the war's start, the French attack into Alsace and Lorraine had proved a debacle, effectively repelled by the German defences. With the inevitable advance of the Schlieffen Plan meanwhile, the French were thrown very much on the defensive. 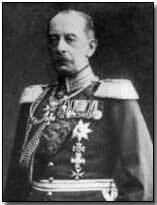 Germany's Schlieffen Plan, named after its chief architect, Count Alfred von Schlieffen, was both offensive and defensive in nature. Schlieffen - and the men who subsequently enhanced and modified his strategy, including Helmuth von Moltke, German Chief of Staff in 1914 - took as his starting assumption a war on two fronts, against France in the west and Russia in the east. The nature of the alliance system ensured that Russia was allied with France (and latterly Britain), set against Germany's alliance with Austria-Hungary and Italy. Notwithstanding the potentially enormous size of the Russian army, with its never-ending supply of men, Schlieffen assumed - largely correctly, as it turned out - that it would take six weeks or longer for the Russians to effectively mobilise their forces, poorly led and equipped as they were. Banking on this assumption, Schlieffen devised a strategy for knocking France out of the war within those six weeks. In order to do so he would commit the vast majority of German forces in the west to form an overwhelming assault with Paris as its aim, leaving just sufficient forces in East Prussia to hold off the Russians during the latter's mobilisation process. Once France had been dealt with the armies in the west would be redeployed to the east to face the Russian menace. In striking against France von Schlieffen determined to invade through Belgium; for tactical as well as political reasons, an invasion via Holland was discounted (Germany desired Dutch neutrality for as long as possible); and Switzerland in the south was geographically invasion-proof. Passage through the flat Flanders plains would offer the fastest route to France and victory. Working to a tight deadline, five German armies would advance through Belgium and France in a grand wheel motion, turning through the Flanders plains north-east of France. The German forces would move from Alsace-Lorraine west through France en route for Paris. Schlieffen's often-quoted remark, "when you march into France, let the last man on the right brush the Channel with his sleeve" was based upon this turning wheel-like advance. By outflanking the French armies von Schlieffen aimed to attack from the rear, where the French were likely to be most vulnerable. A small German force would guard the Franco-German border, enticing the French to move forward, upon which they would be attacked from the rear by the main bulk of the German army, assuring encirclement and destruction. A side benefit of the Schlieffen Plan saw the bulk of the French resistance situated within France rather than in Germany. Even while retreating - which was by no means part of the plan - the Germans could (and did) entrench themselves deep inside French territory. Whilst the French aimed to evict the invader from their country - and consequently constructed their own trenches lightly, never intending that they should be in use for any great length of time - the Germans dug deep, sophisticated trenches, content to remain where they were pending a further advance at some later stage. The weakness of the Schlieffen Plan lay less in the rigidity of the timescale - for the German army very nearly succeeded in capturing Paris within the time allotted - but in its underestimation of the difficulties of supply and communication in forces so far advanced from command and supply lines. Ultimately, it was these problems, particularly in communicating strategy from Berlin, that doomed the Schlieffen Plan. The Allied forces could rush troops to the front by use of the railway faster than the Germans could arrange fresh supplies of food and reserve troops. Most critically, Moltke's isolation from the front line not far from Paris led to a series of poor decisions and a crucial weakening of his forces in the north. A promptly timed French counter-attack exploiting a gap in the German lines at the First Battle of the Marne set off the so-called 'race to the sea' and the onset of static trench warfare. The rapid war of movement was brought to an end. Austria-Hungary's plans for war are much less discussed than those of France and Germany, and with good reason. In devising first Plan B and then Plan R, Austria-Hungary assumed that the coming war would be limited to Serbia. Plan B (for Balkans) detailed the requirement for six Austro-Hungarian armies in the field, three to invade Serbia, with a further three guarding the Russian border to dissuade an attack from that quarter. Plan R (for Russia) essentially revised Plan B, allowing for a greater volume of troops to guard against Russian assistance for the Serbs in the south, whilst assuming German activity in the north. This led to four armies being deployed against Russia and two against Serbia. Whilst the chosen plan in August 1914, in the event this strategy never came to fruition, since in committing to the Schlieffen Plan Germany devoted the bulk of its manpower to the west before intending to turn its attention to the east. Russia, meanwhile, put together two very different plans for war. Plan G assumed that Germany would launch the war with a full-scale attack against Russia; the opposite of what actually transpired. Unusually, Plan G was content to permit German infringement of Russia's borders, with the consequent loss of territory and large-scale casualties, pending completion of Russian army mobilisation. In short, the Russian military assumed that the country could readily bear a string of defeats at the start of the war, such was the reserve of manpower ultimately available to the army. Once effectively mobilised, they believed that the Russian army would inevitably eject Germany from within its borders. Napoleon had failed to conquer the vastness of Russia; it was assumed that Germany would likewise fail. Plan 19 - also known as Plan A - was less drastic in its initial sacrifice of Russian manpower. Russia's French partners pressed the Russian military to devise a more offensive war strategy. Plan 19, devised in 1910 by General Danilov and substantially modified in 1912, correctly assumed that Germany would open the war with an attack against France rather than Russia. This being the case, two Russian armies would advance into East Prussia and to Silesia en route to central Germany. Russia would at the same time make use of a fortress defence against invading forces. In the event, the Russian advance into East Prussia was thrown back almost immediately upon the start of the war, with the Russian army suffering a particularly crushing defeat at Tannenberg, followed by lesser setbacks at the First and Second Battles of the Masurian Lakes. The British did not devise a general war strategy in the same sense as France, Germany, Austria-Hungary and Russia. Unlike these powers, Britain had no particular desire for war to break out, and had no plans for expansion, although she was keen to protect her interests, in particular her trading links with her far-flung empire. However once war broke out Britain, governed by Asquith's administration, and after some initial confused dithering, determined to come to the aid of 'Brave Little Belgium' (as Belgium was represented in the initial British propaganda recruitment campaign) and to France. In the absence of a conscripted army, the British Expeditionary Force (or BEF) was to be transported to the continent and onwards by rail to Belgium and the French left flank. It was estimated that it would take three full weeks, 21 days, to mobilise the BEF; Germany and France banked upon mobilising within 15 days. Belgium, by its very neutrality, could not openly plan for war. Instead, upon the declaration of war (or, in the case of Germany, invasion), the entirety of Belgium's armed forces, comprising 117,000 field troops, were concentrated west of the River Meuse in the (ultimately unsuccessful) defence of Antwerp. Some 67,000 additional fortress troops were responsible for the defence of the forts at Liege, Namur and Antwerp. The Serbian plan for war was simple: upon declaration of war the army would be doubled from five to ten divisions and placed in readiness to strike against Austria-Hungary once it became apparent what the latter's tactical intentions were. The U.S. was determined to adopt a stance of rigid neutrality at the start of the war, and President Wilson announced the American stance to this effect shortly after war broke out, on 19 August 1914, reflecting U.S. popular opinion. Consequently the U.S. had no plans for war and played no initial part in the conflict. Despite official neutrality, a huge leap in export to the Allies led to a vested interest - at least in the eastern states - in an Allied victory. Exports to Germany and its allies rapidly diminished in parallel to a significant rise in shipping to Britain and France. Popular opinion in favour of the Allies began to build as news spread of Germany's allegedly aggressive tactics, which were said to include a terror campaign against 'little Belgium'. Similarly, Germany's policy of unrestricted submarine warfare caused much ill-feeling in the U.S. The sinking of the Lusitania in May 1915 and the Sussex in April 1916 nearly brought the U.S. into the war, and it was Germany's continued submarine policy that ultimately brought about Wilson's war address to Congress on 2 April 1917. Other factors, such as suspicions of German involvement with Mexico (via the Zimmermann Telegram), solidified popular antagonism against Germany. Once in the war Wilson proposed a plan of sorts; it was not a war strategy but a plan to be put in place once peace had set in; the plan became known as the 'Fourteen Points'; although pushed heavily by the U.S. contingent both in the latter stages of the war and at the Versailles peace conference, these were much watered-down by the French and to a lesser extent the British, as being too idealistic. Among the Fourteen Points were clauses renouncing secret peace treaties; guaranteeing the neutrality of the seas outside territorial borders; calling for the removal of international trade barriers; for a reduction of arms; Polish independence; and for arbitration of colonial disputes. Wilson also called for the establishment of a 'League of Nations' designed to secure ongoing peace. Ironically, as the author of the Fourteen Points, Wilson was unable to persuade the once more isolationist U.S. Congress to ratify his own document. Click here to view a map of the pre-war plans of Germany and France. Click here to view a map of pre-war Europe.